Our website has had an upgrade | What Hi-Fi? If you’ve recently changed your avatar, you may find it’s reverted to the old one, so you’ll need to upload the new one again. Avatar and picture uploads should now work for everyone. There's a simple guide to using the new Forums which should help you get the hang of things. We’ve also added a moving carousel to the homepage with our Top 5 stories of the day, and there’s an easier to spot Competitions tab in the black and white menu bar across the top of the homepage. 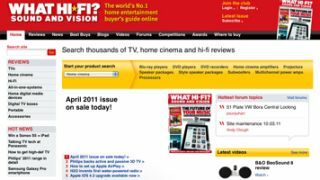 Remember, you’ll need to reset your browser bookmarks and if you do get an error page, please return to the homepage at www.whathifi.com and navigate through the site from there. Please bear with us while the new system settles down: we’re aware of a couple of bugs that need fixing, and if you spot anything else let us know.